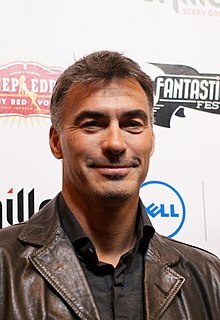 Chad Stahelski (born September 20, 1968) is an American stuntman and film director. He is known for directing the 2014 film John Wick along with David Leitch, and doubling for Brandon Lee after the fatal accident involving Lee on the set of The Crow (1994). He has also worked as a stunt coordinator and second unit director on several films. Stahelski was a friend of Brandon Lee, at Inosanto Academy, who died from a gunshot wound on March 31, 1993, after an accidental shooting on set of The Crow. After the death, Lee's fiancée, Eliza Hutton, and his mother supported director Alex Proyas' decision to complete the film. At the time of Lee's death, only eight days were left before completion of the movie. A majority of the film had already been completed with Lee and only a few scenes remained to be done. To complete the film, the story was rewritten and Stahelski served as a double, while special effects were used to give him Lee's face. Another stunt double, Jeff Cadiente, was also used to complete Lee's part for the movie. The Crow was released in May 1994 and became a box office hit, grossing over $50 million in the U.S., and retaining a loyal cult following many years after its release. Stahelski would appear as a fighter named Ski on the 1997 Action PPV series Fight Zone and played Kumite fighter Max Omega in Bloodsport III. In 2014, Stahelski co-directed the action thriller film John Wick along with David Leitch, based on the screenplay by Derek Kolstad. The film starred Keanu Reeves and Michael Nyqvist, and was released on October 24, 2014 by Summit Entertainment, grossing over $88 million. Stahelski acted as sole director for the film's 2017 sequel, John Wick: Chapter 2. In November 2016, it was revealed that he had begun work on Triple Threat with a script written by Dwayne Smith and set to star Tony Jaa, Tiger Chen and Iko Uwais. Later that November, he was signed on to the reboot of the Highlander franchise, which he committed to making a trilogy of, ending with "The Gathering" of the immortals. It would be similar in thematic development with the original Star Wars trilogy, and similar to John Wick action, but with swords replacing gun-play. The reboot trilogy would still include the iconic music by Queen. In December 2017, it was announced that Stahelski would be directing a film adaptation of the comic book Kill or Be Killed. In January 2018, it was announced that Stahelski will return as sole director for the film's 2019 sequel, John Wick: Chapter 3 – Parabellum. In February 2018, it was announced that Stahelski would be directing a film adaptation of Sandman Slim. ^ Cunningham, Todd (October 26, 2014). "Keanu Reeves' 'John Wick' Hits Box-Office Bulls-Eye and Lionsgate's Gamble Pays Off". thewrap.com. Retrieved October 27, 2015. ^ "John Wick (2014)". boxofficemojo.com. Retrieved October 27, 2015. ^ WEINTRAUB, STEVE (September 24, 2015). "Exclusive: Chad Stahelski To Direct 'John Wick 2' Solo". collider.com. Retrieved October 17, 2015. ^ Scott Roxborough (5 November 2016). "AFM: Tony Jaa, Tiger Chen and Iko Uwais Are a 'Triple Threat'". The Hollywood Reporter. ^ Brian Gallagher (30 January 2017). "Highlander Reboot Will Start a Trilogy, Gets Compared to John Wick". MovieWeb.com. ^ Kit, Borys (2017-12-14). "'John Wick' Director Tackling Ed Brubaker Comic 'Kill or Be Killed' (Exclusive)". The Hollywood Reporter. Retrieved 2017-12-15. ^ Romano, Nick. "John Wick 3 brings back Chad Stahelski to direct". Entertainment Weekly. Retrieved 19 January 2018. ^ Bui, Hoai-Tran. "'John Wick' Director Chad Stahelski to Direct Dark Fantasy Film 'Sandman Slim'". Slashfilm. Retrieved 13 February 2018. ^ Foutch, Haleigh. "'John Wick' Director Chad Stahelski to Helm Dark Fantasy 'Sandman Slim' for Studio 8". Collider. Retrieved 12 February 2018.